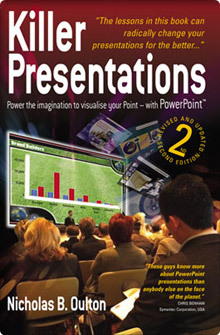 Home ~ Training Presentations ~ Scripts: The root of all presentation evil! Scripts: The root of all presentation evil! In anticipation of a new blog.. here is one I wrote in 2009.. watch this space.. comments please! Why? Because you will come across as an amature! Occasionally when presenters use a script they end up concentrating on it more than on the audience, which is a recipe for disaster. Presentations need to be dynamic and audience-centered. A script, almost by definition, prevents dynamism by compelling you to follow it. Therein lies the real problem.. When you use a script you ignore your slides, when you ignore your slides you drive a wedge between phonetic information (you) and visual information (the screen). That prevents Dual Encoding (understanding by the audience of what they hear and what they see at the same time). So why do people do it? Well, like a number of things that people do to help when they are stressed, it’s easy. You have been reading since you were 3 or 4, and you can do it in your sleep (well, OK not really but it is easy). Reading is easy, and so using a script to help overcome stress is a popular approach – especially when your brain chemistry is being altered by that wonderful survival drug adrenalin. Those that can do; those that can’t… read a script. Not sure I fully agree! … If you LEARN your script, indeed like an actor, then you don’t need to read and can focus on the audience. Having a script diffuses the nervousness + you can plan transitions between slides which makes the presentation more fluid. I agree with Jeff. I guess I have a different definition of “script.” A script is where you write out what you will say and you use it to practice. Without one — and it can be full sentences or just notes, depending on how fluidly your speak — you don’t know how long your talk will take. So I teach to plan, then write the script, then speak it out, recording and timing it. Then you edit. When it’s right, you create your slides and practice with them. After the 4th or 5th practice, you don’t need the script. Then, you’re ready to present and can pay attention to your slides and most importantly, your audience.